When something isn’t broken, there seems little point in trying to fix it, which is exactly the mantra Peugeot has adhered to with the transition from 206 to 207 CC. The earlier model was a great success for Peugeot, selling at a rate of up to 10,000 units a year in the UK in its heyday, and finding particular favour among female buyers with its combination of compact dimensions, stylish looks and a folding metal hardtop roof. Now we’re on to the 207 version of the CC, and on the face of it little has changed. 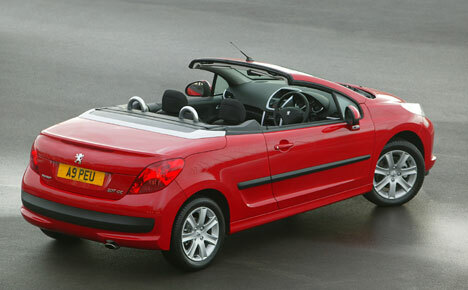 That folding two-piece roof is still there, it’s still jokingly marketed as a four-seater, the boot is still tiny and compromised for loading when the roof is down, and it looks similar to the 206. But then you spend more time with the 207 CC and you see where the improvements have been made. The new range of engines are welcome, with a choice of two petrol units developed in conjunction with MINI, or the ubiquitous 1.6 HDi diesel. Discount the latter first – it’s expensive and is very slow, and leave your choice to either of the petrols. The 150bhp range-topping THP turbo gives more than adequate performance for a car of this type (this is more poseur’s car than sportscar), while the 120bhp version tested here strikes a decent balance between performance and affordability. With real-world operating economy in the high 30s mpg and CO2 emissions of 155g/km this version of the 207 makes financial sense for company car drivers, delivering a benefit-in-kind tax bill of around £50 a month for a 22% taxpayer. The steering has much more weight to it than in the 206 and the gearshift action has been sharpened up considerably. Despite the extra weight that the new model carries thanks to its larger size, it doesn’t feel too lardy on the road. But it’s hard to see where the gains come from with the larger 207. There may be fractionally more room for the two front seat occupants thanks to wider cabin, but the rear “seats” are unuseable to all but young children. The boot is slightly larger – 39 litres of extra space with the roof in place and 12 with the roof down, but it’s still only suitable for a couple of soft weekend bags. Which leaves the 207 CC as an ideal choice for young females with no children who have the option of a perk car on their choice list. As choices go, this 207 is not a bad one to make. Three of these cars are similar in style and price, each offering a retractable metal roof, while the MINI has a canvas item. The Colt leads the way in power terms with 147bhp, compared with 120 in the Peugeot, 115 in the MINI and 110 in the Nissan. 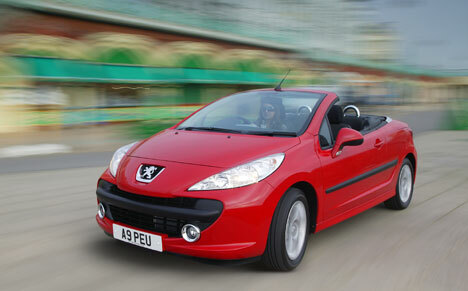 The Peugeot offers fleet drivers the lowest benefit-in-kind tax bills, costing a 22% taxpayer just £52 a month. The Nissan is only just behind at £1 a month more expensive. The Mitsubishi will cost £58 a month and the MINI is a little more expensive at £62. With variable service intervals and the £150 TLC pack which covers servicing and items such as oil, the MINI leads the way in SMR costs. The 207 is next, nearly a penny per mile further back thanks to 20,000-mile intervals. The Colt and Micra need servicing every 12,500 miles. Peugeot claims the 207 will return an average of 43.5mpg, which equates to a fuel spend of around £5,500 over 60,000 miles. The Nissan is very close behind on 42.2mpg while the Mitsubishi and MINI return 39.8 and 38.7mpg respectively. With a residual value forecast of 53% after three years/60,000 miles, the MINI is untouchable here despite its higher front-end price. The Peugeot gets closest at 44% while the Nissan and Mitsubishi are well adrift at 34% and 32% respectively. The MINI does all the damage with its incredibly strong residual value forecast, easing out a 3ppm advantage over the Peugeot newcomer. The Nissan and Mitsubishi are well behind the top two with both costing more than 30ppm to run. The Nissan and Mitsubishi are the first cars to be discounted – they are getting on a bit and both cost too much to run. Which leaves the MINI and Peugeot. If your fleet allows “rag top” convertibles then the MINI’s wholelife costs advantage is hard to argue against. But for those fleets that don’t (and there are many of them), the 207 CC is an ideal choice, being well equipped, stylish and cheap to run compared with its CC rivals. Not too long ago, convertible cars were a no-no on choice lists because of safety and security concerns.